Win A TimeCommand From Stem Innovation! | OhGizmo! It’s back to school time, which means that you’re going to be out shopping for gadgets. After all, you can’t live through another semester without at least a few technological advances, now can you? To help ease that burden we’re going to be giving away some gear. To kick it off, we’re doing a quick giveaway of the TimeCommand from Stem Innovation. You’ll remember our review of the TimeCommand from back in June. It is a great gadget that not only charges your phone and wakes you up at the right time, but it will also control your bedside lamp. Perfect for any dorm. If you want one, just drop us a comment below, and we’ll pick a winner on Friday. Good luck! What a great gadget. I want this! Oh yeah, shining that light is the only way to surely wake me from my kip! Looks like a cool device! dude, that is totally sweet, good luck everyone! I’m not in a dorm anymore, but this would be perfect on my nightstand! I would love to win so i can replace my 6 years old wall clock and have fancy and geeks like watch. This would be nice on the nightstand. time stands still for no man (don’t know who to quote). I have a 24 year old alarm clock. This would be a great replacement!! 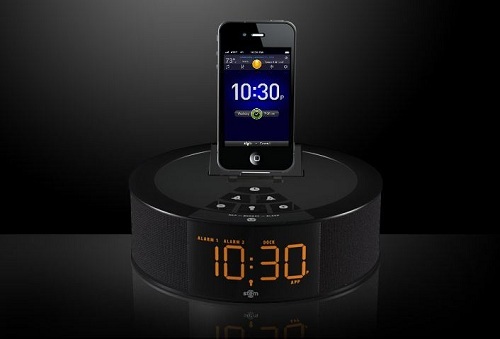 would love to have this for my iphone and wakeup call. Would love to have this one. Right on time.. When my old clock is almost dying.. Thanks Ohgizmo !! this is awesome! looks really slick too. Can’t afford to Be late for work. Will this wake me up if the power goes out? This would be so much better than the clock I was planning to use! As always the best gadget blog on the net. Awsome gizmo… would look great on my nightstand! I want one.. Thanks for opportunity. I loved this gadget.. Can i win it? This is wonderful geek stuff lamp, clock and ipod dock all three in one. I would love to win this and have in my bedroom. Is today last day to enter or already time passed.. If not please count me too. This would be grt to win.. Thanks for having such wonderful contest. I can give this as gift to my son. Will be nice to have in my living room. Get giveaway. I m in. I hope my entry is valid and will be accepted. that would be awesome and i don’t even live in a dorm room.